I hate Glocks. Let me say that again, I hate Glocks. They are an overrated, plastic, ugly handgun. I never even wanted one. I am a 1911, Revolver, and Hi Power kind of guy, that’s it. Three years ago Missouri joined the ranks of States that allowed its owners to Conceal Carry Handguns. I went through my training and obtained my permit. I ordered a fine High Noon holster for my Kimber and all was great in my world. I carried that combination for several months and was very happy with my choice. Then, it got hot….and humid. I understand most people can carry a 1911 concealed in warm weather, but for me it was not going to happen. In shorts and a t-shirt you could not only tell I was carrying but I am sure you could tell the caliber and brand by the bulk sticking out of my pants. At 5’10” and 170 lbs., I don’t have a large enough frame to hide that in summer attire. I had to have something smaller. A good friend of mine is a retired LEO with the Missouri Department of Conservation and suggested a “Baby Glock”. I read up on them and took the plunge, against my better judgment. When I picked it up I have to admit that I was impressed with how well it shot. It was ugly, no doubt but it did shoot well. I started trying all sorts of ammo through it, hoping in the back of my mind that it would find something that it did not like. It did not, I tried White Box all the way to 9mm+p+ and all shot great. 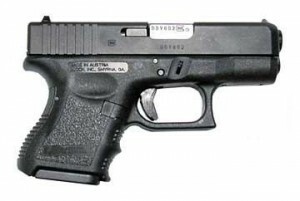 I have about 2000 rounds through the G26 now and have not had a single FTE or FTF. I am impressed! I carry this handgun in a High Noon Down-Under and it conceals very well. I ride bikes with my son, play baseball, and even spent some time last summer at the beach with no signs that I was carrying a handgun. The finish still looks great and even the plastic still seems to be holding up fine. I still carry my Kimber much of the time. But when the summer comes and the weather gets hot I have to admit I do not feel guilty at all when I slip my G26 on and head out for a day in the sun and humidity. I feel the ammo I carry will stop any problem when placed in the right spot and my ugly little Glock is up to that challenge. Do I still hate Glocks ….yes, all of them but mine. It is not for sale.